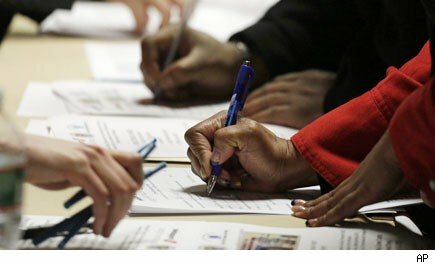 The number of Americans filing new claims for unemployment benefits unexpectedly fell last week, suggesting a pick-up in the labor market recovery. Initial claims for state unemployment benefits fell 7,000 to a seasonally adjusted 340,000, declining for a second straight week, the Labor Department said on Thursday. The prior week's claims figure was revised to show 3,000 more applications received than previously reported. Economists polled by Reuters had expected first-time applications to rise to 355,000. The four-week moving average for new claims, a better measure of labor market trends, also fell 7,000 to 348,750 -- the lowest level since March 2008 -- pointing to some firming in underlying labor market conditions. A Labor Department analyst said no states had been estimated and there were no special factors influencing the report. The data has no bearing on February's employment report, due on Friday, as it falls outside the survey period. According to a Reuters survey of economists, employers probably added 160,000 jobs to their payrolls last month, a small pick-up up from January's 157,000 count. That would just be enough to hold the jobless rate steady at 7.9 percent. More:The Real Reason There Are So Many Long-Term Unemployed? Economists say job gains of at least 250,000 a month during a sustained period are needed to significantly dent the ranks of the unemployed. Job growth averaged 200,000 in the last three months. While layoffs have subsided, companies aren't in a hurry to step up hiring as domestic demand remains lackluster. Claims remain tucked in the low end of a 330,000 to 375,000 range for this year. High unemployment prompted the Federal Reserve last year to launch an open-ended bond buying program. The U.S. central bank said it would keep up the program until there was a substantial improvement in the outlook for the labor market. In testimony to Congress last week, Federal Reserve Chairman Ben Bernanke signaled the central bank would press forward with plans to buy $85 billion in bonds per month. The number of people still receiving benefits under regular state programs after an initial week of aid rose 3,000 to 3.1 million in the week ended Feb. 23. The four-week moving average of so-called continuing claims was the lowest since July 2008.